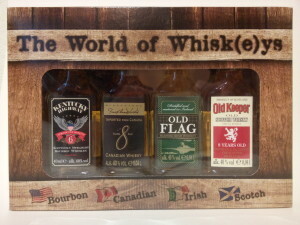 When I saw an advertisement for the assortment “The World of Whisk(e)s” at the local discounter chain Hofer (the Austrian version of the German Aldi), I was too intrigued (for research purposes) to pass on the offer: 4 x 4cl bottles of US, Canadian, Irish and Scottish Whisk(e)y for the price of 5,99€. They are all bottled at the minimum required strength of 40%, are all coloured (even the Bourbon…) and all bottled in Germany. 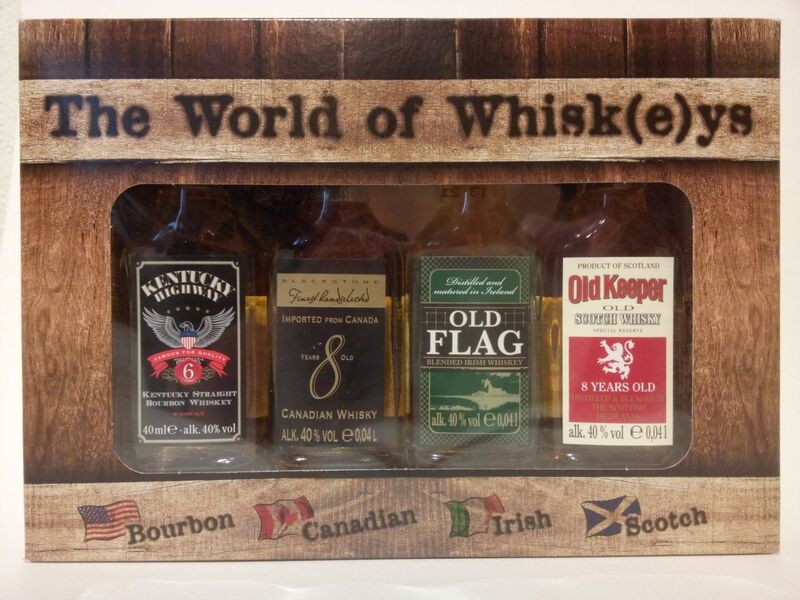 Each and every bottle (except for the Irish) carries statements like “Famous for Quality”, “Finest handselected”, “Special reserve”. As they’re all bottom-shelf products, I find these statements a little hard to believe. But, to be fair, they’re not aimed at the discerning connoisseur anyway. I’ll try to give them my honest opinion anyway, as I do with every spirit I taste on this blog. Little fun fact: On the inside of the box there’s a picture of Strathisla distillery. Nose: Bourbon indeed. An initial hit of alcohol and medicinal notes, then some sweet corn, and while I try to tell the other notes apart the nose fades away into a light, fruity, very typical nose with the alcohol making up for the most part. Taste: Very watery and dilute, slightly bitter, with an aroma as faded as the nose – tastes like a regular Bourbon diluted 50:50 with clean spirit. Verdict: A typical bourbon, but presented for the non-bourbon drinker who might be just starting out. No overwhelming aromas, quite dilute (and difficult to tell apart) in flavour, but no off-flavours as well. Nothing to write home about and a bit lacking for the more experienced drinker. Nose: “Gone in 60 seconds” as well, but even more extreme. Just when I thought I got a bit of a nose after the initial alcohol hit there was… nothing except for a bit of alcohol. I can swirl the glass as hard as I want, it doesn’t get any better. Maybe some herbs, but that’s it. Zero, nada, niente. With a drop of water I get faint notes of herb liqueur. Finish: Very smooth and pleasant, goes down like butter, more herbal notes remain for a bit but very faint like nose and taste. Verdict: I can’t say anything bad about it – but not smelling or tasting much I can hardly say anything good about it either. This would have a hard time getting through if mixed into a cocktail or drunk on the rocks. Nose: Not the most complex nose either, but better than both its predecessors, Lemon zests, faint vanilla, lots of grain sweetness, green apples, pears, ginger. Quite a lot of (3rd, 4th, 5th…) refill casks going on here I presume. Verdict: The nose was quite fine but palate and especially finish say otherwise. My taste buds need a break before I get to the Scotch next. Well, I wasn’t expecting much (and was ready to be surprised…) but my expectations were met. The best was the Bourbon – most likely profiting from the need for fresh barrels and I could see it being used for cocktails and for beginners. The rest was… uninspired with the Canadian exemplar being very weak/dilute in both smell and taste, the Irish being too young and spirity and the Scotch being once again very dilute. They all taste to me like a mixture of half a bottle of “good” whisk(e)y mixed half and half with neutral spirit. But maybe that’s what they’re supposed to taste like – very faint and easy to drink, never overwhelming or complex. There sure is a market for these drams – but in my opinion they’re not for the discerning whisk(e)y connoisseur. There might be some good bottom-shelf drams out there, three of the four from the ones tasted here are not amongst them. But, honestly, what do you expect for the money (taking the prices for a full bottle into account), after taxes and duties only cents remain for the product itself, shipping, bottling etc. – they’re not gonna waste the best and finest, especially in times of high demand and skyrocketing prices for the best of the best.